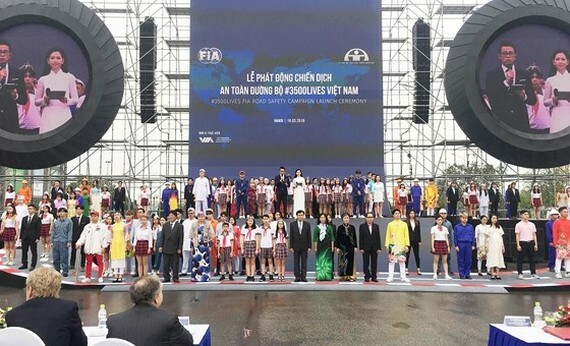 The International Automobile Federation (FIA) and the National Traffic Safety Committee yesterday jointly launched the #3500LIVES campaign to raise the community and the youth’s awareness of obeying traffic rules. The campaign’s activities aims to encourage FIA’s 12 golden rules when driving in streets including no use of hand-held mobile phones while driving, no drinking before driving, wearing helmet on motorbike, electric bikes, wearing seatbelt. At the launching ceremony, Deputy Prime Minister Truong Hoa Binh stressed that this year’s traffic campaign theme is “Ensuring Traffic Safety for Passengers and Motorbike Drivers”; saying that the campaign is more meaningful in improving the community and the youth’s awareness and first aid provided to victims of traffic accidents. The campaign is a necessary step in both reducing traffic accidents and implementing the United Nations (UN)’s traffic accident reduction goal. Launched in 2017 by the FIA, the #3500LIVES campaign is organized in 900 cities of 80 countries to remind people that every day 3,500 people are killed on the roads, thus raising their awareness of obeying traffic rules.